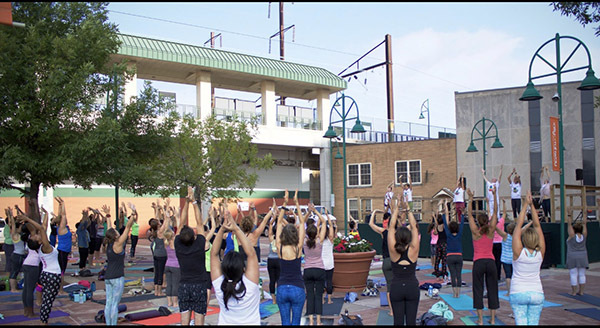 The Train Station Plaza on Irving St.
Join Stacy and Seth Newfeld on Saturday, September 15th, 8:30a-11a, for the 4th Annual Rahway Yoga Mala, a charity yoga event for the benefit of our local food bank, Rahway Food For Friends. Each year since 2015, Stacy and Seth, who’ve lived in Rahway sine 2014, along with a group of Rahway-centric yoga teachers and musicians have gathered in town for an event open to all ages and experience levels, to celebrate Yoga Month, the UN’s International Day of Peace and the impending Autumnal Equinox, and the city of Rahway itself. This year the Yoga Mala event returns to where it began in 2015: The Train Station Plaza on Irving St. There’ll be a few vendors, music, raffles with prizes from Yoga studios all over Union, Essex and Middlesex Counties. And of course, there’ll be Yoga, including yoga for kids! *Every dime raised from this event goes directly to Rahway Food For Friends.